HMD started expanding its lineup from the middle down – 6, 5, 3 and soon the Nokia 2. 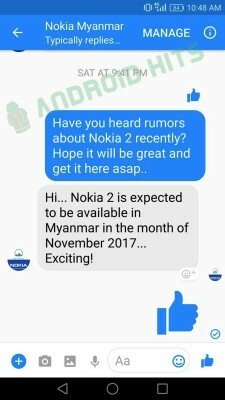 According to Nokia Myanmar’s Facebook account, the new entry-level phone will launch in November. This is for the Myanmar launch, but there's no indication that it will launch sooner elsewhere. The phone switches to onscreen buttons, while all the others (even the flagship 8) have capacitive keys. This way you don’t lose surface area from the already small 4.7” screen. The Nokia 2 will not be the fastest – certainly not with a Snapdragon 210 chipset – but a whopping 4,000mAh battery will make this ideal for old-school folk. This will be nice for me. Small and huge battery, performance? If it good enough for WhatsApp then no problem. I actually use windows mobile and has come a long way, but for office is the best their is;). And their are a lot of office people using it, so, go be a troll somewhere else;).